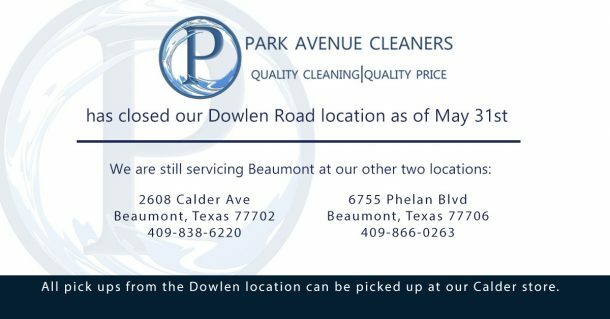 In November 1999 Daniel and Staci Richards acquired Park Avenue Cleaners in Beaumont. At the time the business consisted of only two locations, the original cleaning plant located at 6460 Phelan and one sub-station located at 4105 Dowlen Road. In October 2002, the main plant was moved to it’s own building where it is now located, 2608 Calder making the Phelan location a sub-station. Not satisfied with the quality of cleaning and finishing that they were receiving from the company that they contracted their laundry business to, the Richards’ opted to build their own laundry plant in August 2004 to process their customer’s clothing. Since that time they’ve been able to control the quality of what is put out by the production staff. Since 1999, Daniel and Staci Richards have remained very “hands on” when it comes to the entire cleaning process. They remain a constant fixture in the plant. Both deal with customers on a daily basis and control the production from behind the scenes, addressing questions and concerns from customers as they arise. Both the dry cleaning and laundry processes take place at the Calder location.The age and size of the sub-station located on Phelan was not serving it’s customers to the standards that Park Avenue Cleaners continuously strives to achieve. For this reason, the substation was moved to it’s current location, 6755 Phelan – Madison Plaza, in January 2006. The new location has turned into a quick favorite. Join our mailing list to receive the latest news and updates from Park Avenue Cleaners.